Every year, our kids are exposed to billions of dollars worth of marketing. The fast-food industry alone spent $4.2 billion in 2009 on their marketing efforts; in 2008, the Coca-Cola Company spent $752 million on advertising. Not to be outdone, PepsiCo spent $1.3 billion. This is especially troubling, as more than 23 million children and teenagers in the United States are overweight or obese, putting them at risk for major and even life-threatening diseases and conditions. But recently, a coalition of federal agencies led by the Federal Trade Commission took a stand against aggressive marketing tactics by issuing guidelines to limit the products companies can hawk to our kids. 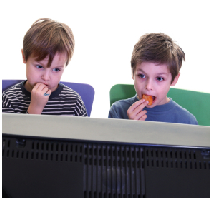 The voluntary principles would prevent companies from marketing unhealthy goods to children through a variety of media. Many food marketers have promised to fight these voluntary principles. Will you ask the FTC to finalize these important guidelines? Let’s protect our children. PreventObesity.net is the only online national network of people solely dedicated to reversing the childhood obesity epidemic. We connect Leaders across the movement with hundreds of thousands of Supporters in advocacy efforts to implement policies that will help reduce childhood obesity nationwide. in support of the movement to prevent childhood obesity.